First off, can I say how much more I LOVE the UK cover?! The city is actually on it! And it doesn't look like a Middle Grade book! Anyway, back to the facts. I loved Wither. The writing was fantastic and elaborate. I wasn't as blown away by Fever, but I'm still going to read Sever when it's out in the right edition. I'm really curious about this new Dystopian series! I've never read a book set in a city in the sky. I'm also interested in seeing how DeStefano will handle the suicide issue that I think is hinted at. What do you think of Perfect Ruin? Does it sound like your cup of tea? Are you a fan of the Chemical Garden trilogy? Both covers are outstanding, although i'm still leaning towards the American cover. Great pick this week :-). I've seen this on a few WOW's today! I have it on my TBR, and will be watching to pick up a copy when it's released! Great pick! Boy this book sure is popular today. Hoping you like this book a lot. Come visit me as well. Oo, I love that cover, I've been seeing the red and black one recently. 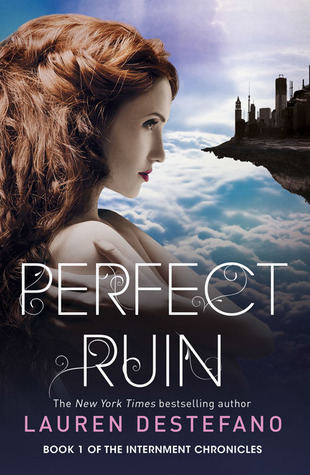 Have you seen that Bibliopunkk Reads is doing a giveaway for Perfect Ruin? Here is my WoW for Tandem! Oh! I haven't seen that cover before! It's gorgeous! I seriously can't wait to get my hands on this book! Sever was a good ending to the series, I liked it much better than Fever!